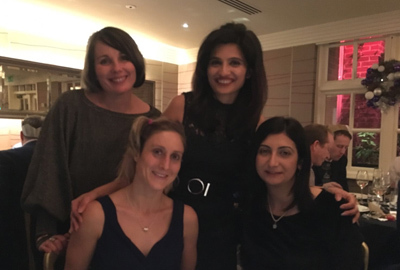 We have learned a lot from doing one round of IVF - mostly that it is a learning process for everyone including the consultants! I don't know anyone for whom it has worked first time - now we can see why. The whole thing is like a freakish science experiment with you as the subject! If it works first time you are just lucky. If not, they look at what worked well and what didn't, and feedback the lessons learned into the next iteration. At our very first consultation they had described IVF as a process of attrition; hopefully all the changes would give us better odds at every stage. We also learned a lot personally. 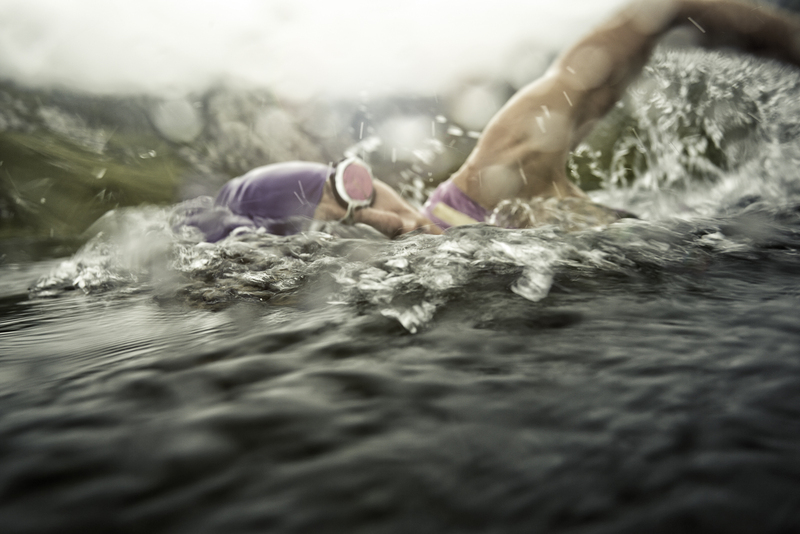 Although there are some disadvantages to being an athlete, there are also some positives - like I didn't find it as hard physically as I was expecting. Friends had described it as a regime, which I guess is true - you have to be absolutely disciplined and 'on it' with timings and never forget any of the steps. But again I'm used to that from years following my triathlon training program! Likewise I am used to physical pain and discomfort every time I do a hard session. Being fit also means the body is more resilient and recovers better from the assault! The first day is a literal panic because I can't even open one of the new medications. I have been told before, IVF is not for everyone, and one of the reasons is needing a practical brain. Never getting confused with lab procedures and measurements even under pressure! This drug has to be mixed from a powder by adding sterile water, then measured up again into a different syringe. Except I can't open the bloody thing and the instructions didn't say how to - do I twist or pull the cap off? If I get this wrong it is going to be £350 worth of medication all over the floor. The clock is ticking and this is meant to be done at an exact time every day. 15 minutes gone and I even attempt to open a second one in case there is something wrong with the first! I literally feel sick and think to myself, do I call Simon? But what can he do? He's 40 minutes away and loses a day's pay if he leaves work. Do I knock on one of the neighbours' doors? Take it to work and get help? But the office is also 30 minutes away... I must have eventually pulled harder in my panic, because it finally opened! I could have cried with relief, and was almost too drained to go to work. Hardly the perfect start! We (or at least I) have to attend the clinic every other day for scans so they can adjust doses if necessary, and decide the best day for surgery. It is a pain fitting appointments around work. Fortunately the op date comes around much quicker this time thanks to the short cycle! You would think the medications and surgery is the hard part - I did too. But that's the easy bit! The part you have some control over. Once finished, everything else is out of our hands. Every day is a nervous wait for the phone call to tell us how things are progressing. Thankfully most of the news is good this time. 8 have fertilised. Most seem to be growing well, so the clinic does not need to do an emergency transfer on day 3 like last time! We get to day 5 as planned, and one embryo is 'textbook' quality - this is the one they will transfer. I know many people have two embryos transferred, and sure - it would be great to have the chance of twins and get it all over and done with in one go! But we are advised that would be a much higher risk at every stage (miscarriage, complications, premature birth...) Especially for someone of my size - 5'3", low BMI and high muscle tone - these all mean that there is less growing space! The day after implantation we are told two more of our embryos were suitable to freeze. We are surprised to learn that only about half of IVF cycles end up with ANY embryos to freeze. So this time we have been lucky! The countdown to Christmas continues, but it seems to take forever to reach New Year when we can take the pregnancy test! Not the best timing when I am advised to pre-emptively follow dietary guidelines as if I am pregnant. I rarely drink alcohol, but over Christmas I would quite like the odd glass of wine, or bit of Christmas pudding set alight with brandy, not to mention all the cured meats, blue cheeses and smoked salmon on offer... Hopefully the abstinence will be worth it! Then there is the constant speculation - could I be pregnant? Every symptom is overanalysed to the point of hypochondria and enough to drive a person crazy! I hardly slept the night before the test - waking up every hour, until by 4am I decided finally this is late enough in the day! Those 3 minutes took forever... but it was positive! I feel relieved - for now. But we have been here twice before, and know there is still a long way to go. But at least now I can get a few hours' sleep before getting up again for work! So the end of one nervous wait is simply the start of the next - until our first scan in 3 weeks' time. The one downside of a positive test is now I have to start taking more injections - just as I was enjoying the break from them! This time blood thinners for the thrombophilia the hospital picked up a few months ago. 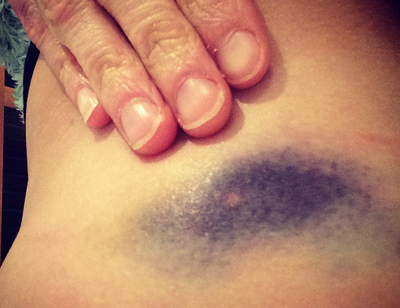 Anything to reduce the risk of miscarriage is worth it but bloody h*** they create some special bruises (unlike the other IVF meds that only left a small mark at most). Bruises from blood thinners are worse than falling off my bike! Thankfully George (our consultant) says I can exercise again, as long as I avoid contact sports! He advised me to take it easy (relative to my normal) but that still means I'm allowed to swim, run and ride my bike :-) Just shorter and easier than usual. Exercise instead of training! I decided to run a cross country for TVT, just because I have missed doing anything except one MTB race since September. I haven't run in the Thames Valley League for 3 years, but - I looked this up afterwards - I had won 17 of the last 21 races I entered! I knew today would be different - I was just going to participate for enjoyment, not actually race. But that doesn't change other people's expectations when they see me turn up, no-one believed me when I said I was just going to jog round. Mentally it is much harder to do that than race properly and do my best! But even if I had wanted to 'race', I couldn't. I have missed 4 months of training so I am massively unfit. I am also around 7 weeks pregnant, so running is harder work and I feel sick if I go above a steady pace. I am also not about to do anything stupid after all we have gone through, and push myself! I can't say I enjoy not being competitive, but it's better than not taking part at all. Plus everyone knows this league is all about the cake and social at the finish ;) I have been absent from the club for so long that it is good to see people again. For now, Simon and I just have to keep our fingers crossed for the next scan. We are trying not to look more than one step ahead, although it is hard not to get our hopes up. 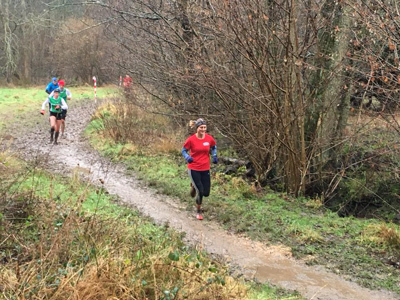 In the meantime perhaps I will have another outing at the final cross country for TVT! I have deliberated whether to post this yet - as it was never intended to be an announcement of news! Yet I can't really tell the story without giving away our current situation! So we decided to publish this anyway, whatever happens, posting this is not going to make any difference to our final outcome! So until 12 weeks and beyond, all we can do is hope for the best!